If you landed here then I am sure either you’re fan of Dexter Laboratory’s or you really looking for “Omelette du fromage” pardon “Omelette au fromage”. The famous cartoon character gave this word a big hype by just saying Cheese Omlette in french. So, in this article we’ll be moving ahead to two important things first what is Omelette du fromage and second how to make Omelette au fromage at home? Let’s dig some holes and find new secrets about Omelette du fromage. What does ‘Omlette du Fromage’ mean? 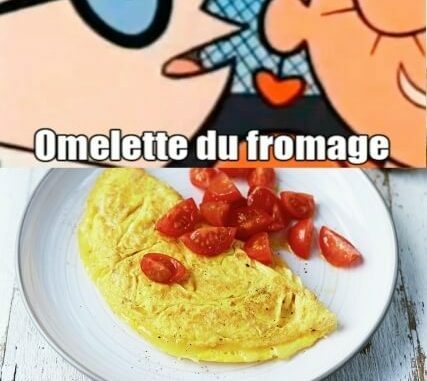 Although, now it’s a joke from Dexter’s laboratory, in one of the episode Dexter try to seduce girl by speaking (bad) French so he says things like “Omelette du fromage” which means nothing in French. “Omelette au fromage” however means cheese omelette. Omelette du Fromage or Omelette au Fromage? This is a bit tricky to answer as if you’re asking in reference to Dexter’s Laboratory then “Omelette du Fromage” is what he used in one of his episode whose meaning is stated above but if you’re hungry brat and desperately looking for Cheese Omelette (just kidding) then “Omelette au Fromage” would suit the best. Anyways, this led us to a delicious point. So, let’s not wait for more and make Omelette au Fromage i.e. Cheese Omellete. Eggs are fantastic and an affordable source of protein. Cheese on the other has it’s own nutritional benefits. Having Cheese Omelette for breakfast or supper can give you a good kick-start and makes you feel fuller till the next meal. Making this simple Cheese Omelette is not a very big task. It’s super easy to cook and gets ready in 10 minutes only. Let’s move ahead to ingredients and recipe of Omelette au Fromage. Crack the eggs into a mixing bowl, season with a pinch of sea salt and black pepper, then beat well with a fork until fully combined. Place a small non-stick frying pan on a low heat to warm up. Grate the cheese onto a board and set aside. Add ½ tablespoon of oil to the hot pan, then carefully pour in the eggs. Tilt the pan to spread them out evenly, using a fork to swirl the eggs around the pan a little. When the omelette begins to cook and firm up, but still has a little raw egg on top, sprinkle over the cheese. Using a spatula, ease around the edges of the omelette, then fold it over in half. When it starts to turn golden brown underneath, remove the pan from the heat and slide the omelette onto a plate. Stay tuned for more such stories and delicious recipes and don’t forget to mention your experience with the Omelette au Fromage Recipe in the comment section below.